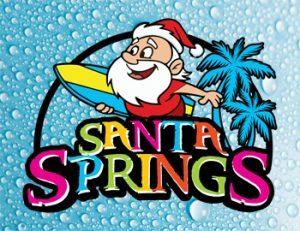 Santa Springs – Coming To Santa’s Village Azoosment Park Summer 2019! Opening Summer 2019 Santa Springs Dynamic Water Experience will be the perfect place for families to cool down and enjoy water fun. Santa Springs marks Santa’s Village’s largest expansion ever and will join the park’s list of premier attractions, including thrill rides, kiddie rides, games, shops, food temptations and more than 200 animals. Santa Springs will feature zero-depth entry to a 10,000 square foot, 8-inch deep wading pool with a two-story interactive water play structure. The water play structure will include dozens of water toys with two giant tipping buckets and six water slides, including a 50-foot long, four lane kiddie racer slide. While the kids play in the water area, parents can sit back and relax in surrounding lounge chairs or private cabanas. A new on-site 2,000 square foot bath house can be utilized for families to dry off and change before and after enjoying the park’s other attractions. With 24 rides, interactive animal experiences and exhibits, live entertainment, games, special events, promotions, activities, delicious food, and experienced event planners, Santa’s Village delivers an unforgettable day of play. Operating since 1959, Santa’s Village embodies the essence of summer fun and family memories. Santa’s Village is a film friendly location within the Chicagoland and surrounding areas. For tickets or more information visit www.SantasVillageDundee.com or call 847-426-6751. CHECK OUT MORE SAVE ON FUN COUPONS BELOW!! FOLLOW US ON FACEBOOK FOR DAILY COUPONS DISCOUNTS & GIVEAWAYS! Welcome to Chicagofun.com Your One Stop Fun Guide To The Chicagoland Area. We would like to personally welcome you to our online community. We are the premier Online Resource Directory dedicated to having fun in the Chicagoland area. Our comprehensive guides to fun things to do, party planning, special events, travel tips and fun family entertainment will keep you informed on all the latest information about having fun in Chicago and beyond. SAVE ON FUN!! Sign up to receive special events, discounts, coupons and freebies sent right to your inbox! Sign up to receive special events, discounts, coupons and freebies sent directly to your inbox!